Madhya Pradesh Chief Minister Shivraj Singh Chouhan and his wife Sadhna Singh offer food to cows during 'Govardhan Puja' at his residence, in Bhopal. 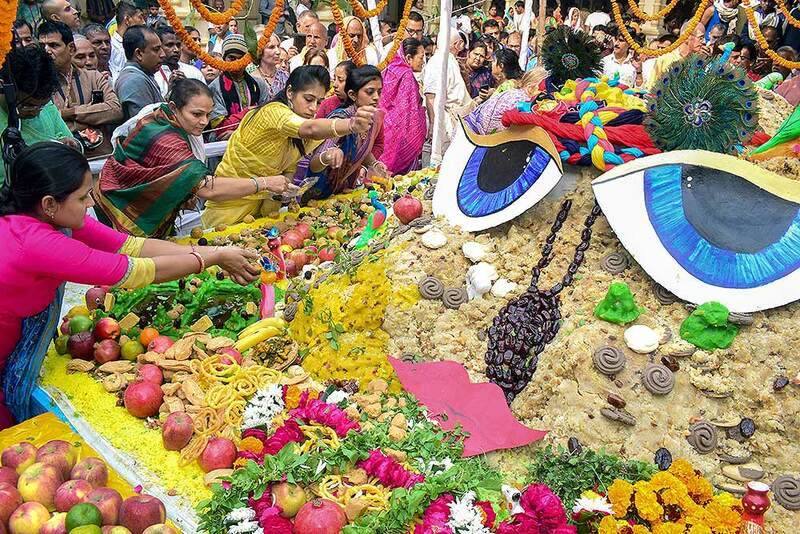 Devotees perform "Govardhan Puja" at the ISKCON Temple in Vrindavan near Mathura. 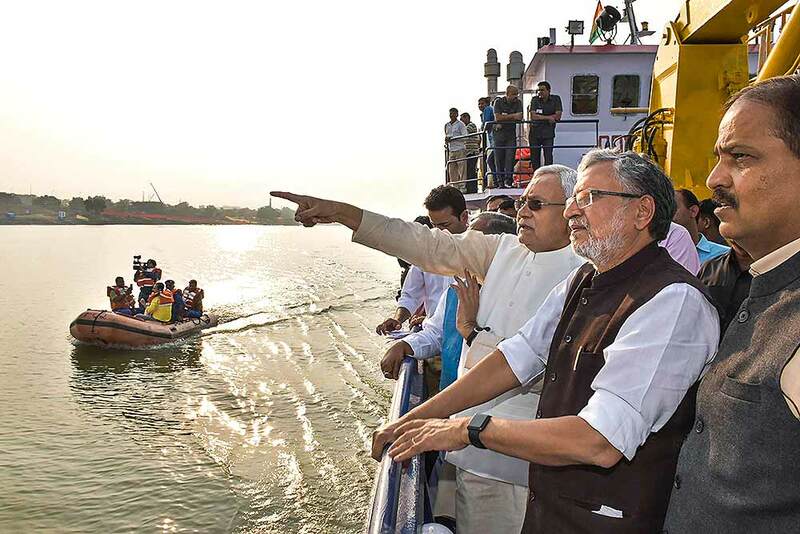 Bihar Chief Minister Nitish Kumar and Deputy CM Sushil Kumar Modi review the preparations for 'Chhath' festival on the ghats of River Ganga, in Patna. 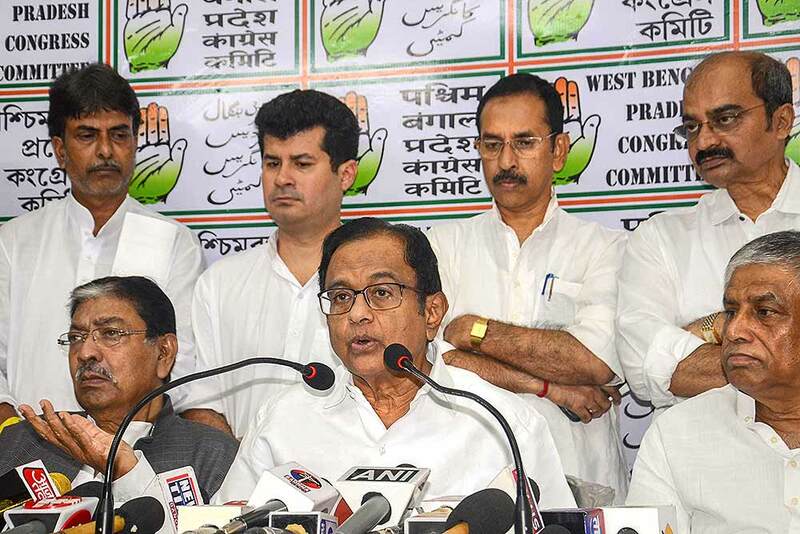 Senior Congress leader and former finance minister P Chidambaram addresses a press conference on the second anniversary of demonetisation at West Bengal Pradesh Congress head office, in Kolkata. 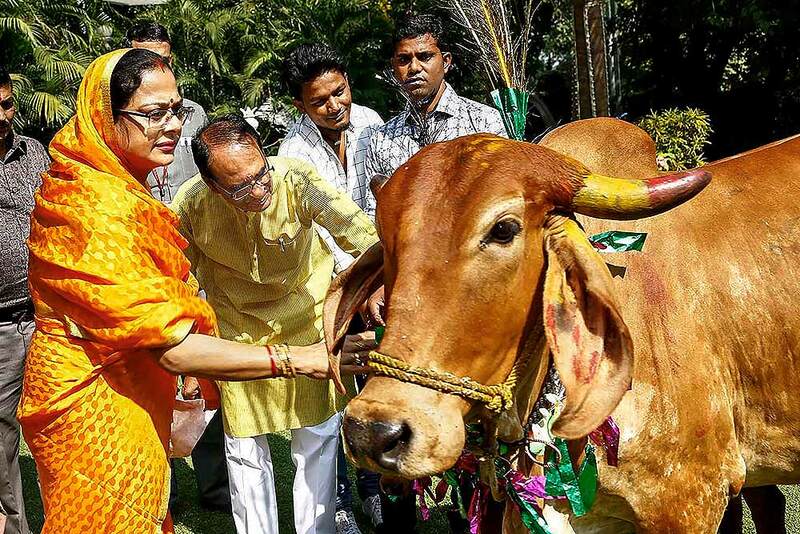 Bengal Congress president Somen Mitra is also seen. 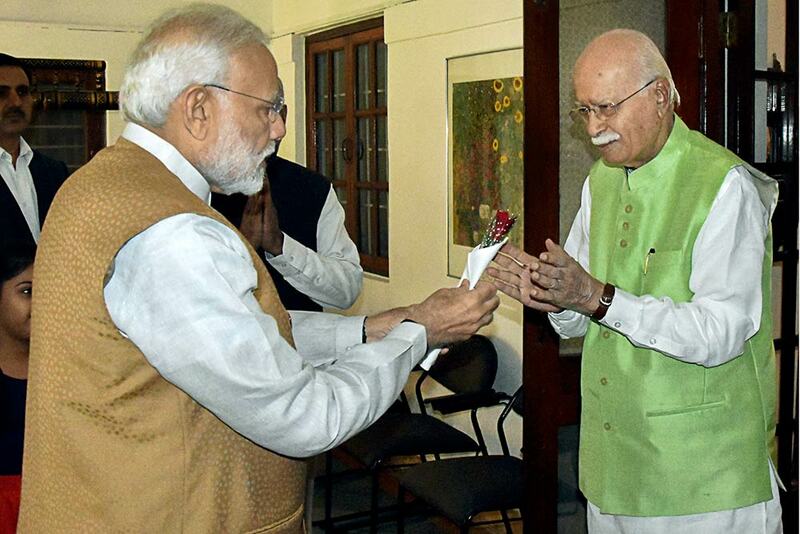 Prime Minister Narendra Modi greets BJP senior leader L K Advani on his birthday at his residence, in New Delhi. 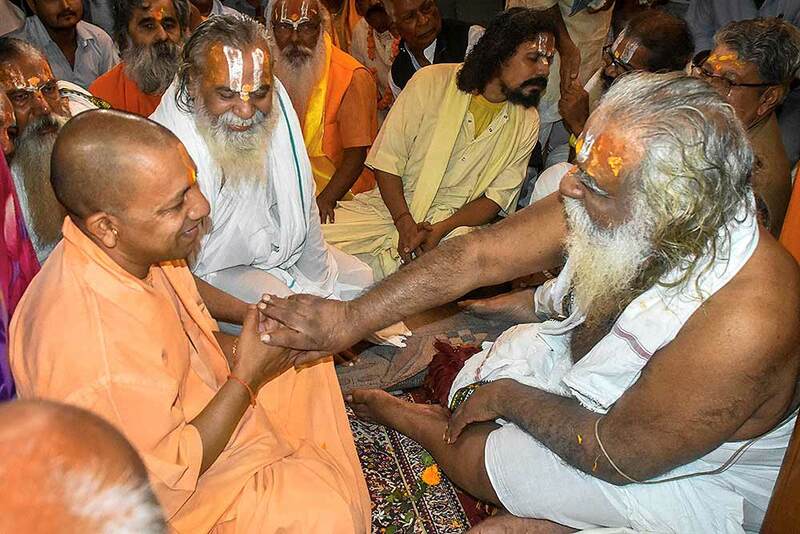 Uttar Pradesh Chief Minister Yogi Adityanath visits Ram Janmabhoomi Nyas (RJN) president Mahant Nritya Gopal Das, in Ayodhya. 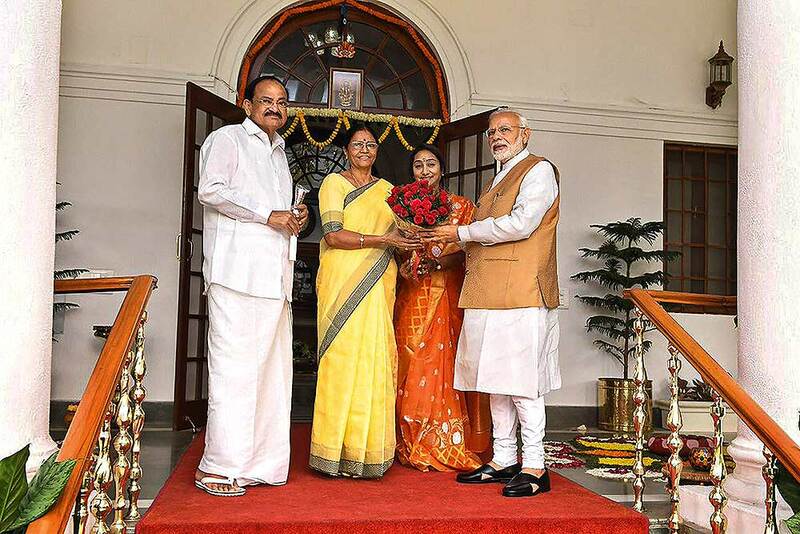 Prime Minister Narendra Modi greets Vice President M Venkaiah Naidu on the occasion of 'Deepavali' at Vice President's House, in New Delhi. 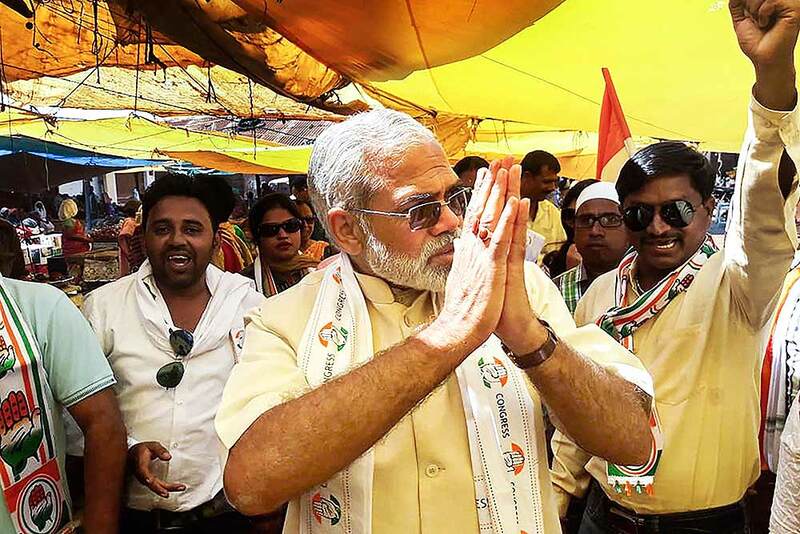 In this undated photo, a Prime Minister Narendra Modi look alike campaigns for Congress Party in Dantewada district of Chhattisgarh. 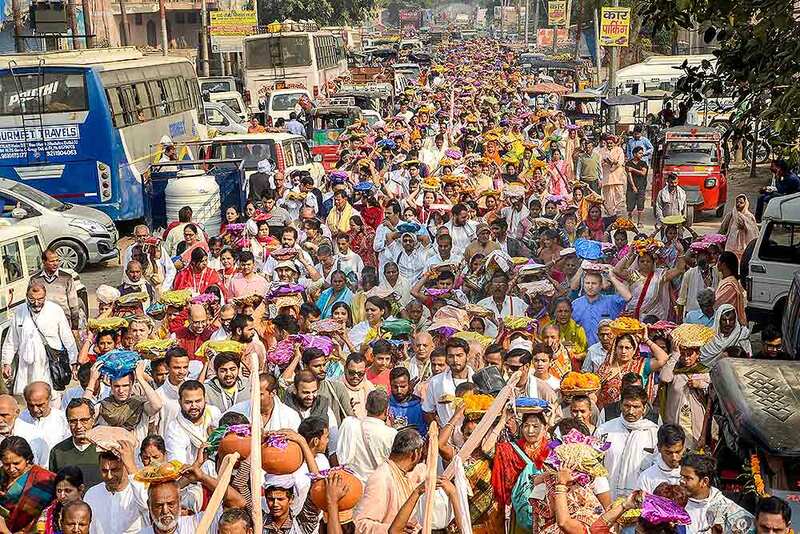 Devotees carry offerings on their head while trekking to the Govardhan Hill to celebrate the festival of 'Goverdhan Puja' at Goverdhan town near Mathura. 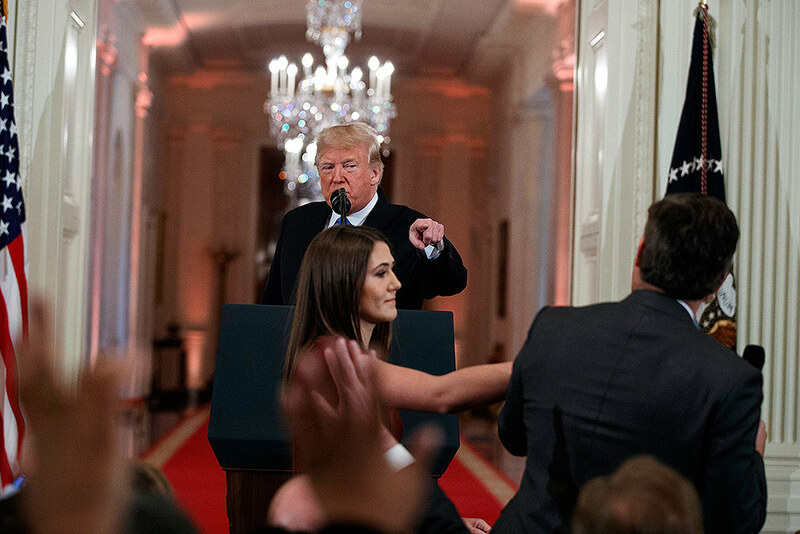 US President Donald Trump watches as a White House aide reaches to take away a microphone from CNN journalist Jim Acosta during a news conference in the East Room of the White House in Washington. 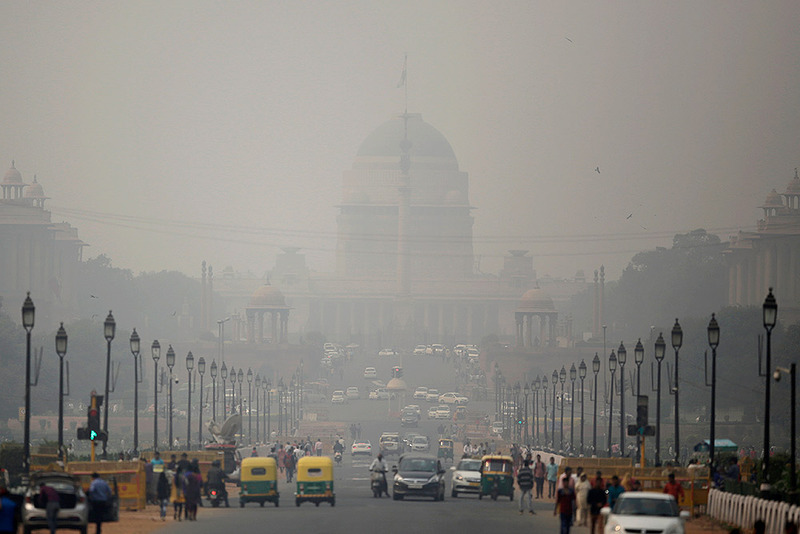 Rashtrapati Bhawan, or the Presidential Palace is partly visible due to smog as traffic plies on Rajapth, the ceremonial boulevard in New Delhi. 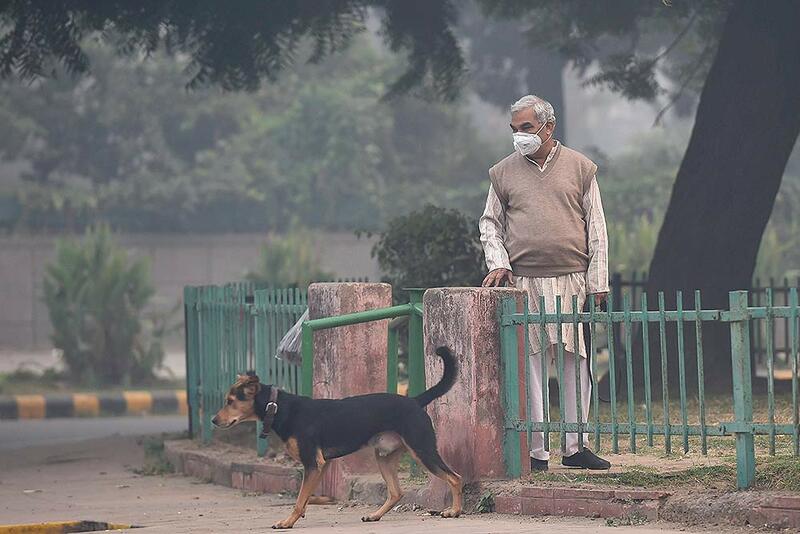 Toxic smog shrouds the capital as air quality falls to hazardous levels with tens of thousands of people setting off massive firecrackers to celebrate the major festival of Diwali on Wednesday night. 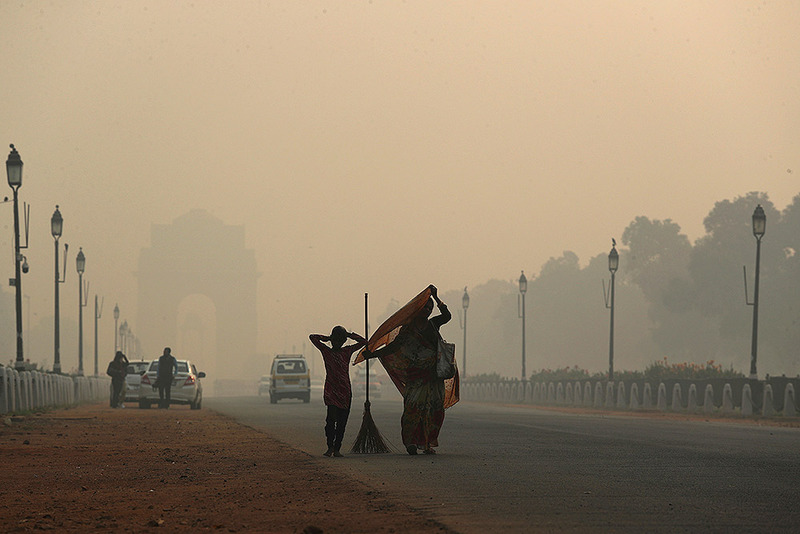 A municipal worker with her daughter leaves after sweeping the India Gate area as a thick lawyer of pollution haze hangs a day after Diwali festival, in New Delhi. 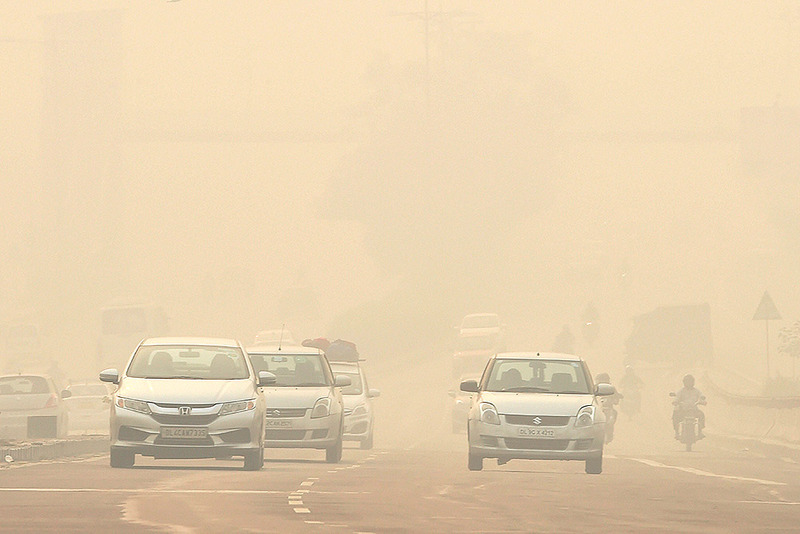 Commuters drive through heavy smog, a day after Diwali celebrations, in New Delhi. 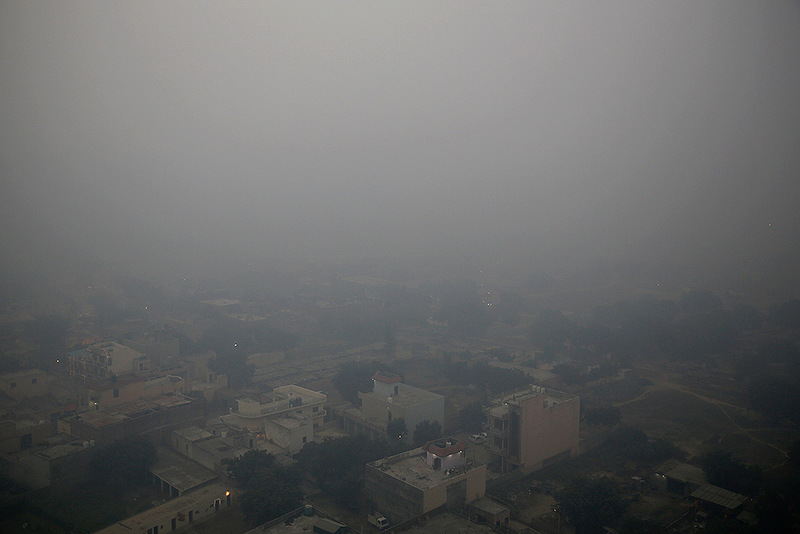 Morning haze envelops the skyline on the outskirts of New Delhi. 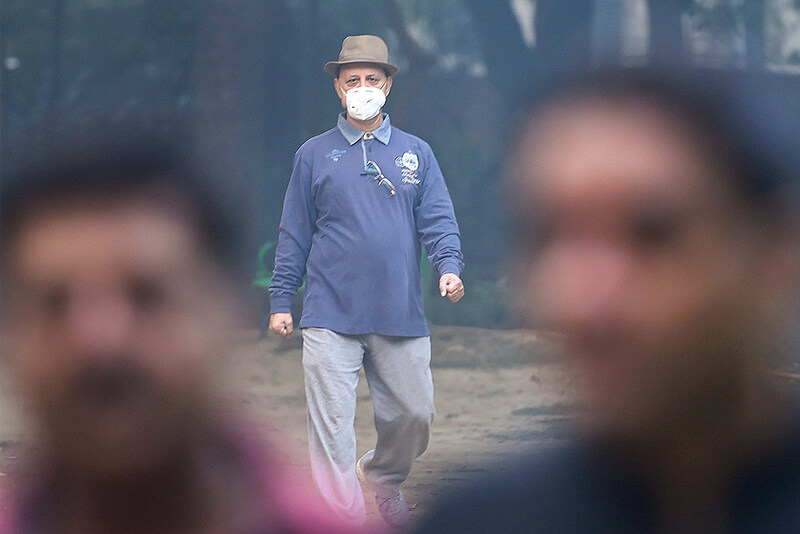 Morning walkers wear pollution masks as thick haze engulfs city a day after Diwali celebrations, in New Delhi. 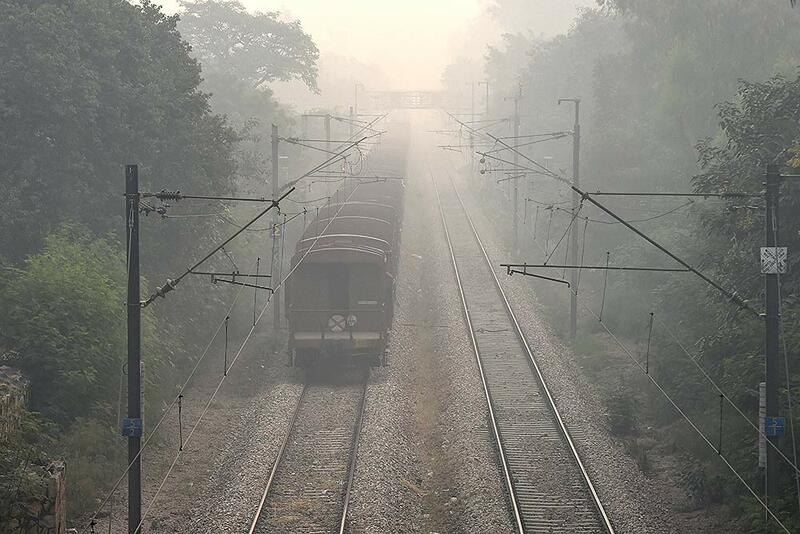 A train runs through the thick haze, a day after Diwali celebrations, in New Delhi. 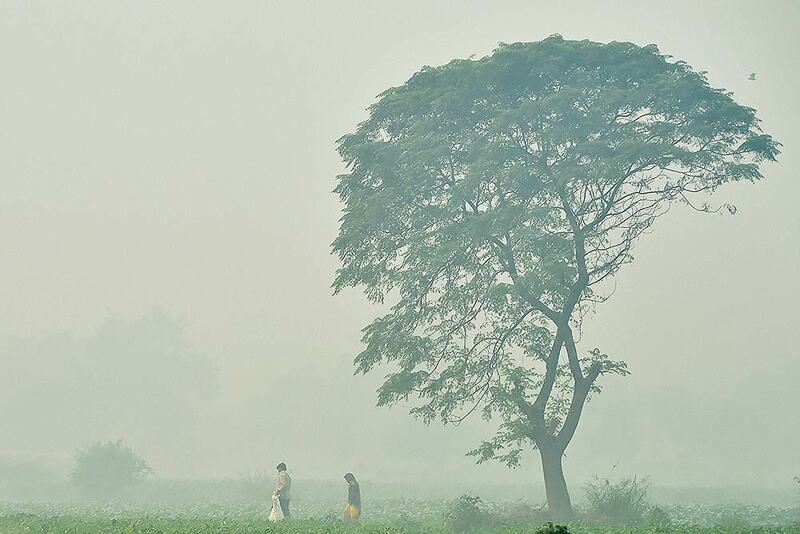 People walk across a field engulfed in thick haze, in New Delhi. 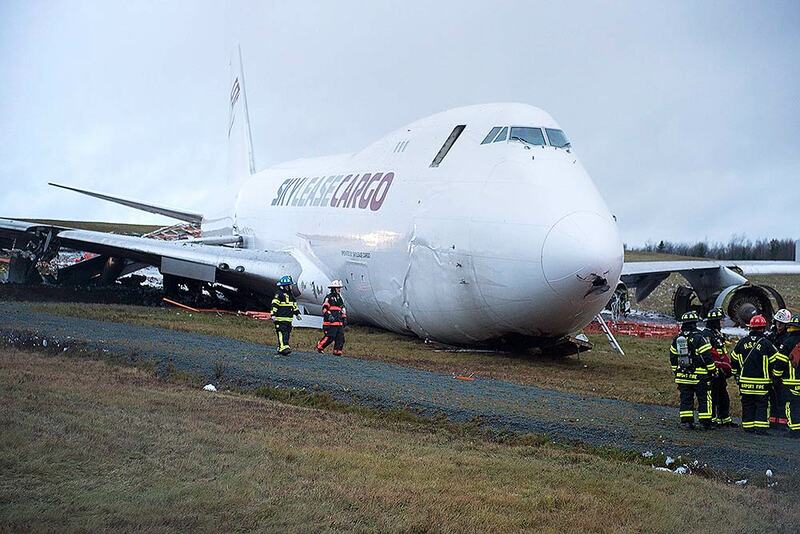 Emergency responders work the area where a SkyLease Cargo plane skidded off a runway at Halifax Stanfield International Airport and stopped near a road early in Halifax, Nova Scotia, Canada. 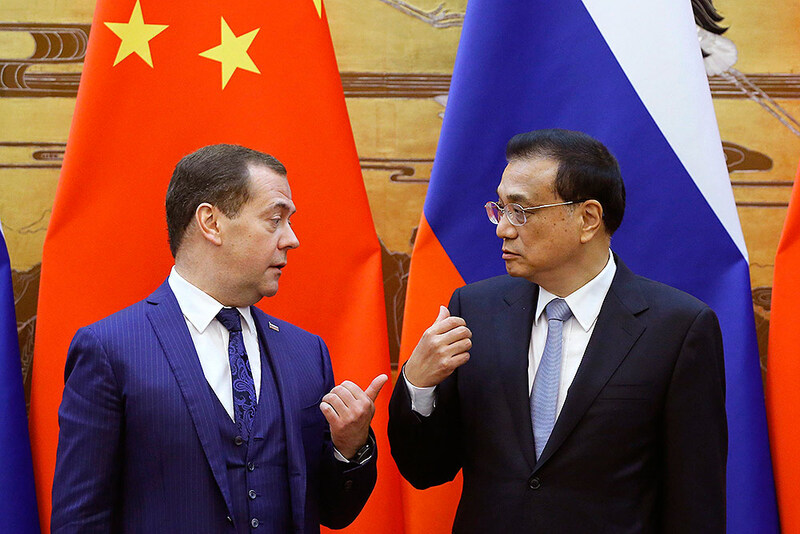 Russian Prime Minister Dmitry Medvedev, left, and Chinese Premier Li Keqiang attend a signing ceremony at the Great Hall of the People in Beijing. 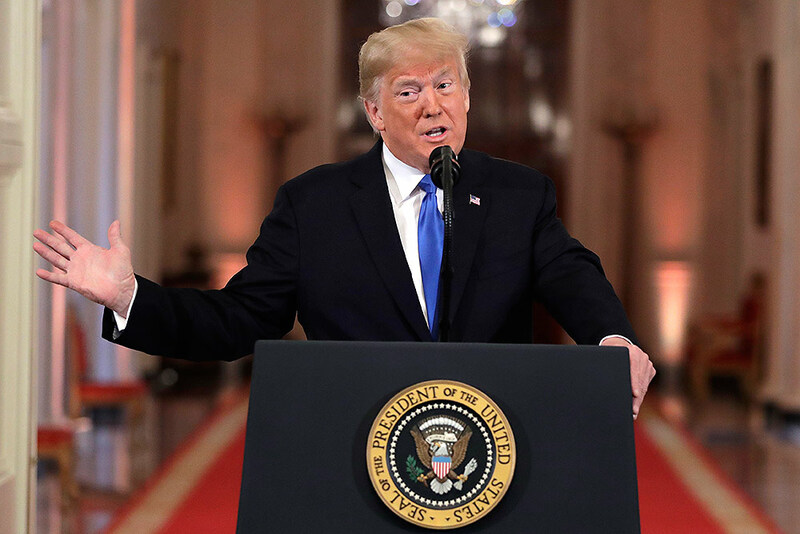 US President Donald Trump speaks during a news conference in the East Room of the White House in Washington. 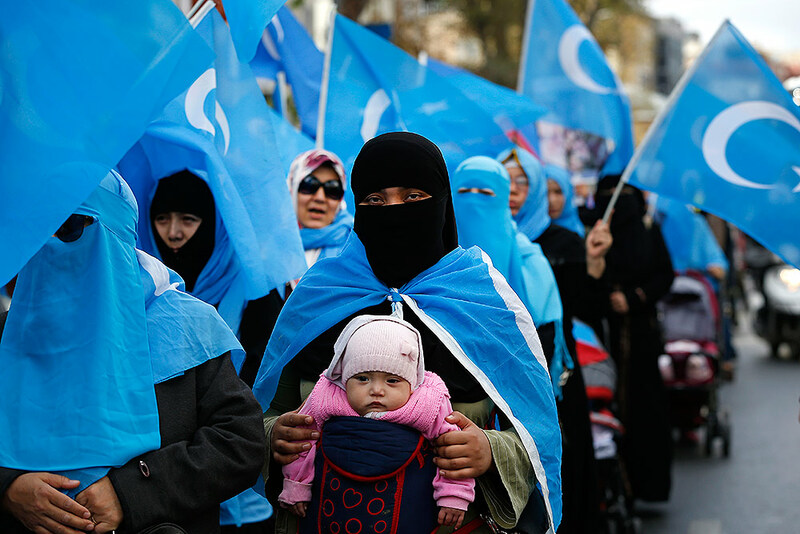 People from the Uyghurs community living in Turkey carry flags of what ethnic Uighurs call 'East Turkestan', during a protest in Istanbul against what they allege is oppression by the Chinese government to Muslim Uighurs in far-western Xinjiang province. 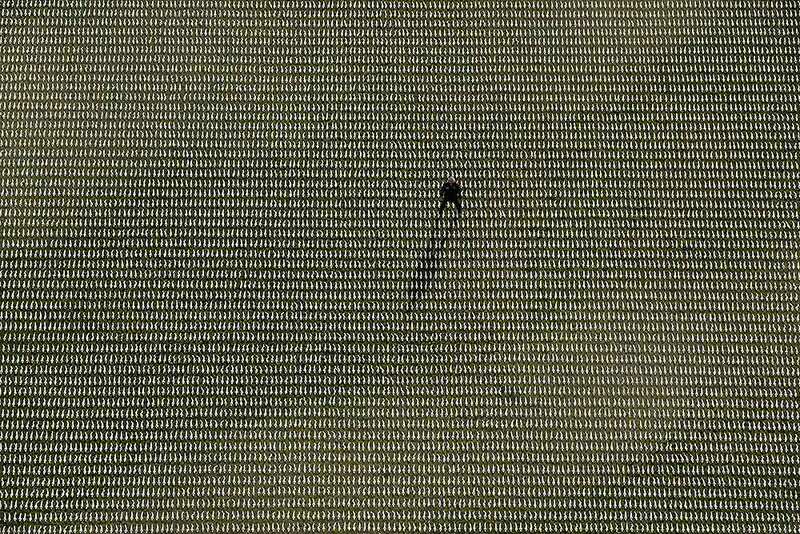 British artist Rob Heard poses for photographs amongst rows of 72,396 shrouded figures which form his piece of commemorative art 'Shrouds of the Somme' to mark the upcoming centenary of the end of World War I, in the Queen Elizabeth Olympic Park, London. Each figure is a human form, individually shaped, shrouded and made to a name of the 72,396 missing British and Commonwealth servicemen who were killed fighting in the Somme area of France between July 1, 2016 and March 20, 1918 who have no known grave and whose names are engraved on the Thiepval Memorial in France. World War I ended on November 11, 1918. 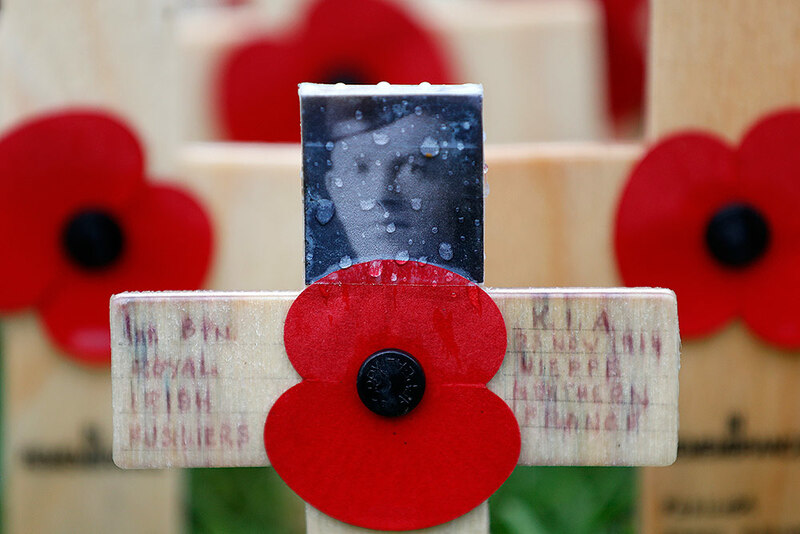 A rain drop covers a photograph of Gerald Briedell of the Royal Irish Regiment who was killed in action on Nov. 23, 1914, adorns a cross placed in the Field of Remembrance at Westminster Abbey in preparation for the annual Armistice Day commemoration for the dead and injured military and civilian in conflicts around the world on Nov. 11, in London. 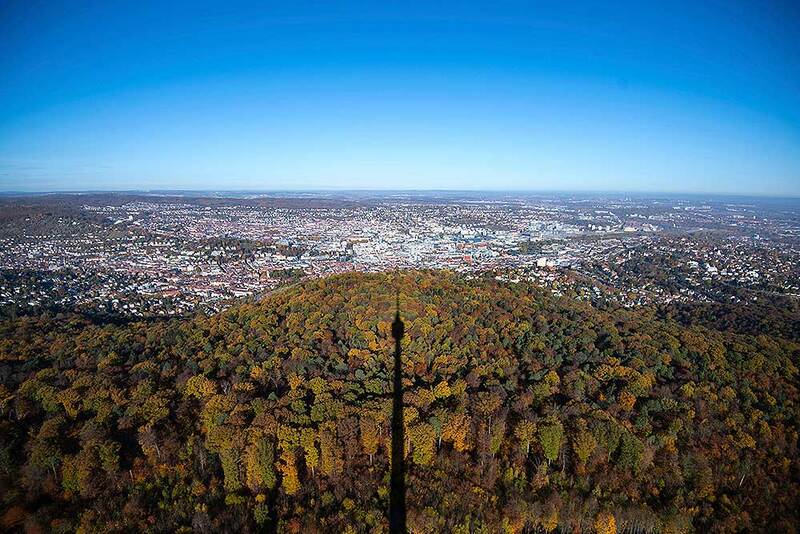 The TV tower casts a shadow on the autumnal colored forest in Stuttgart, southern Germany. 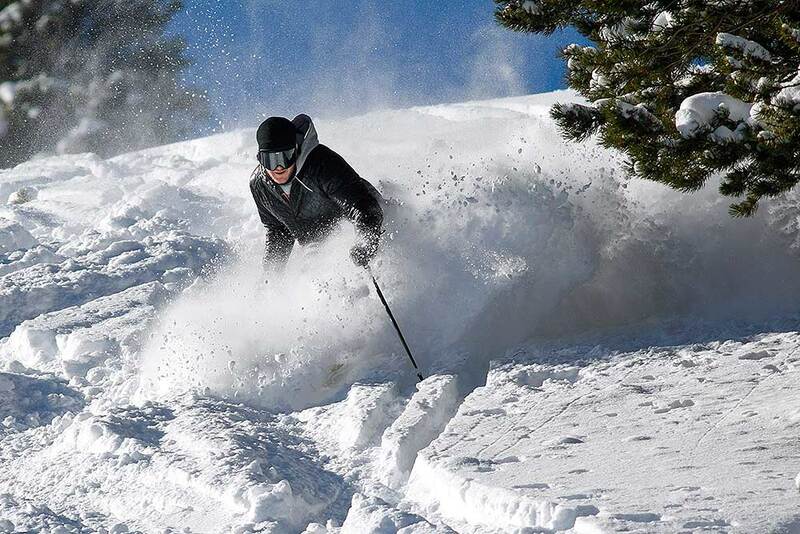 A skier makes a turn in fresh snow on Breckenridge Ski Resort's opening day in Breckenridge, Colorado. The resort opened early after receiving more than 5 feet of snow already this season. 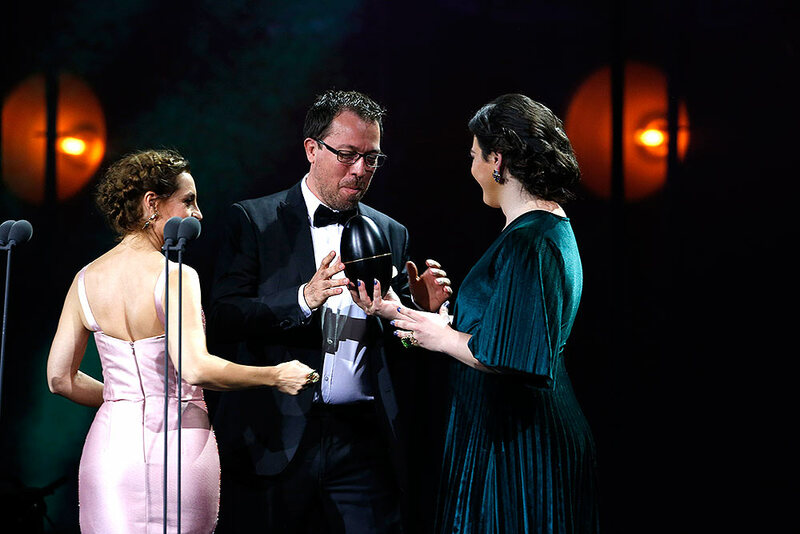 Paraguayan film director Marcelo Martinessi, center, receives the Best Director award for the film "Las Herederas" during the Fenix Iberoamerican Film Awards at the Esperanza Iris Theater in Mexico City. Mexico's Gael Garcia receives the award for Best Ensemble for a series, for the series "Aquí en la Tierra" during the Fenix Iberoamerican Film Awards at the Esperanza Iris Theater in Mexico City. Actress Brooke Shields, left, and journalist Katie Couric attend the CMX CineBistro opening night special screening event hosted by The Cinema Society in New York. 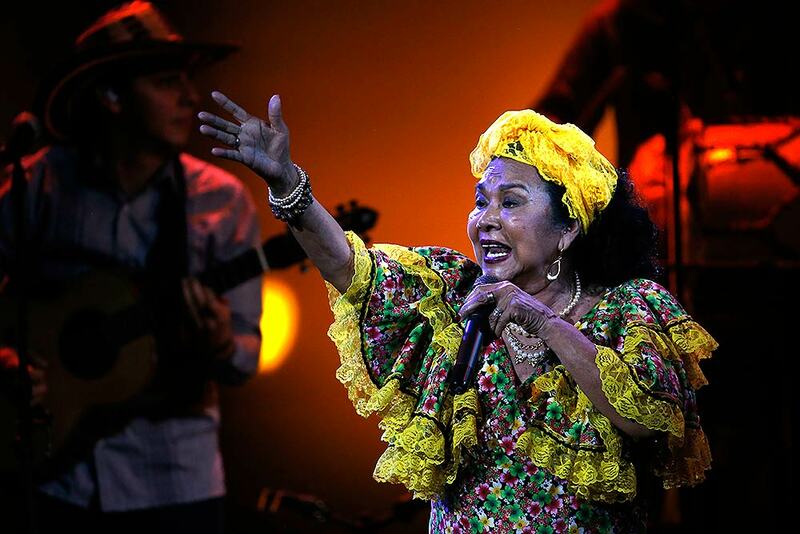 Colombian singer Toto la Momposina performs during the Fenix Iberoamerican Film Awards at the Esperanza Iris Theater in Mexico City. Model Chrissy Teigen attends the WSJ Magazine 2018 Innovator Awards at the Museum of Modern Art in New York. Actress Cara Delevingne attends the WSJ Magazine 2018 Innovator Awards at the Museum of Modern Art in New York. 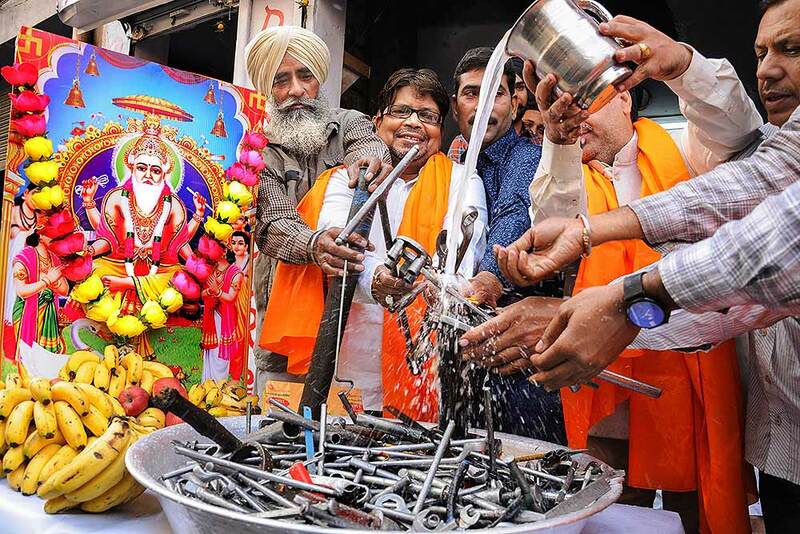 Mechanics wash their tools with milk on the occasion of 'Vishwakarma Puja', in Amritsar. 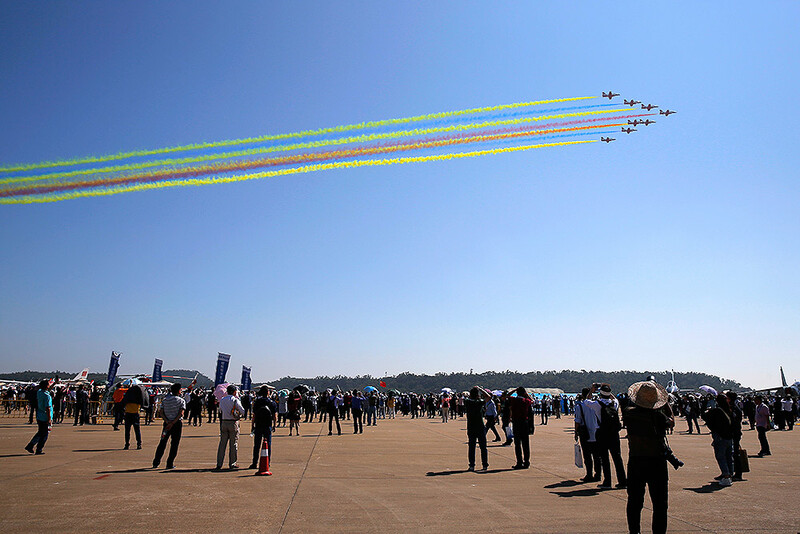 China's K-8 aircrafts from the Aerobatic Team "Hongying", meaning Red Eagle, of Chinese PLA's (People's Liberation Army) Air Force perform during the 12th China International Aviation and Aerospace Exhibition, also known as Airshow China 2018, in Zhuhai city, south China's Guangdong province. 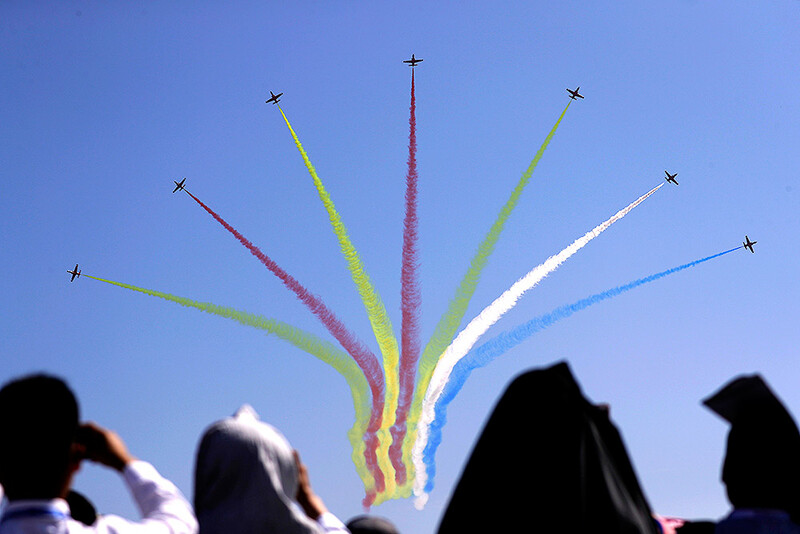 Chinese August 1st Aerobatics Team perform during the 12th China International Aviation and Aerospace Exhibition, also known as Airshow China 2018, in Zhuhai city, south China's Guangdong province. 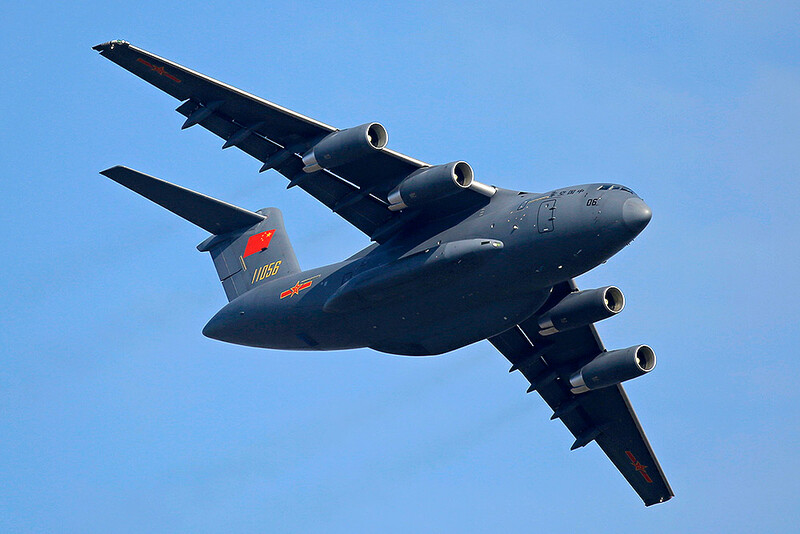 A Y-20 transport aircraft of the Chinese People's Liberation Army (PLA) Air Force performs during the 12th China International Aviation and Aerospace Exhibition, also known as Airshow China 2018, in Zhuhai city, south China's Guangdong province. 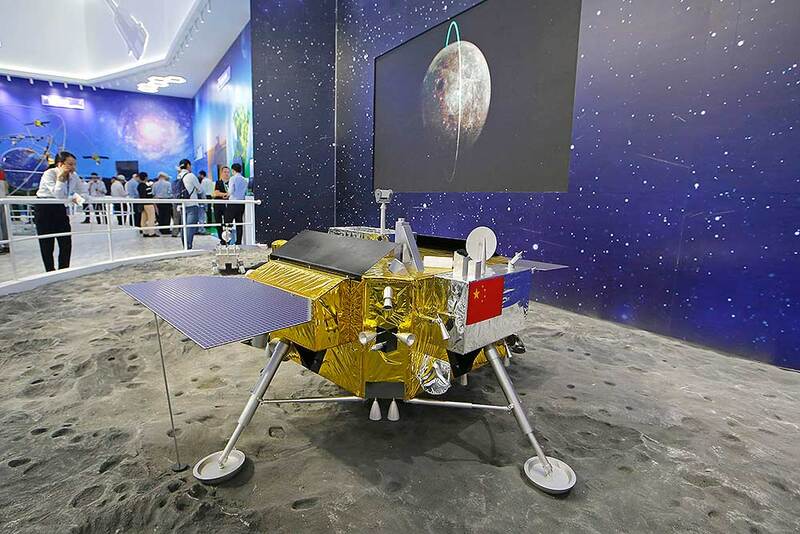 A model of a Chinese Chang'E IV Relay Satellite is displayed during the 12th China International Aviation and Aerospace Exhibition, also known as Airshow China 2018, in Zhuhai city, south China's Guangdong province. 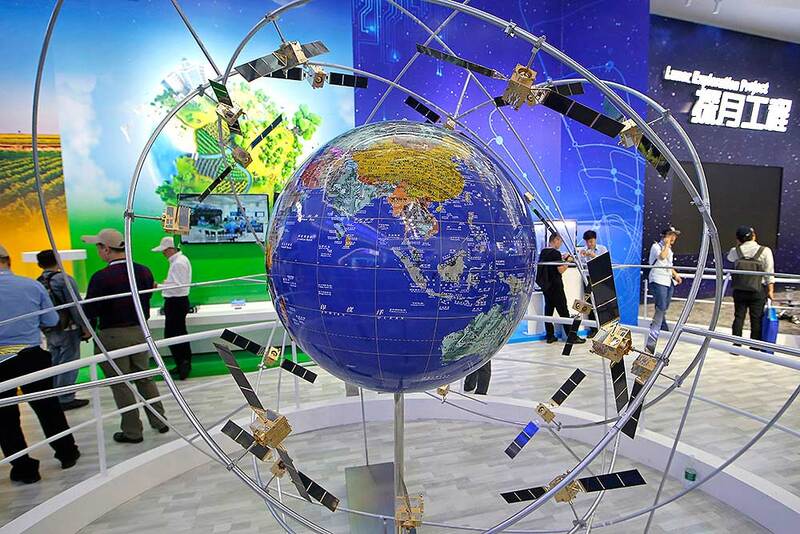 A model of Chinese BeiDou navigation satellite system is displayed during the 12th China International Aviation and Aerospace Exhibition, also known as Airshow China 2018, in Zhuhai city, south China's Guangdong province. 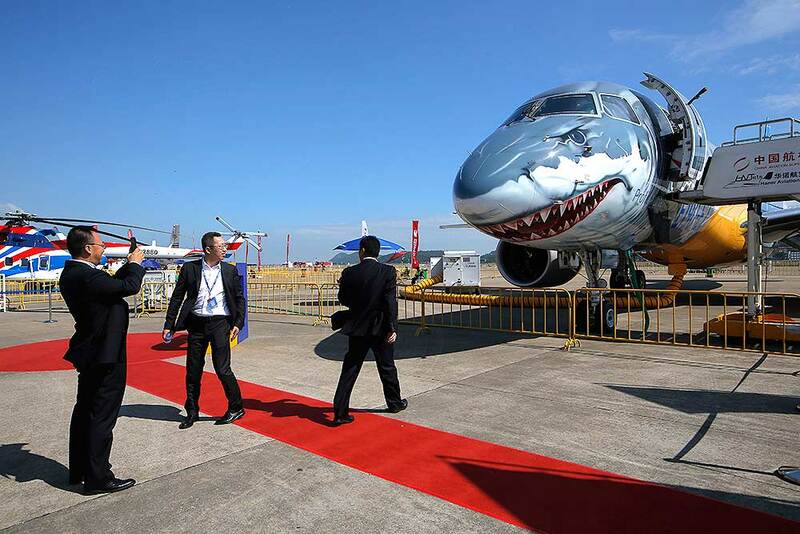 An Embraer E190-E2 Commercial Jet is displayed during the 12th China International Aviation and Aerospace Exhibition in Zhuhai city, south China's Guangdong province. 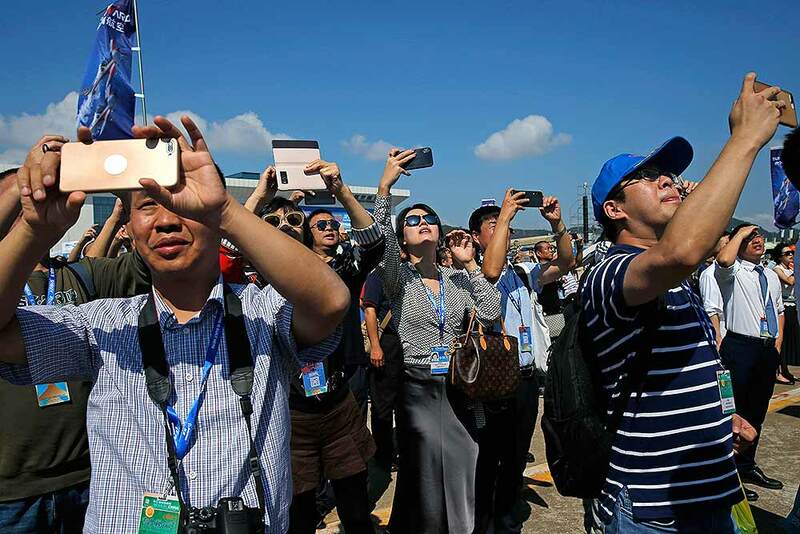 Visitors watch the aeronautical performances during the 12th China International Aviation and Aerospace Exhibition in Zhuhai city, south China's Guangdong province. 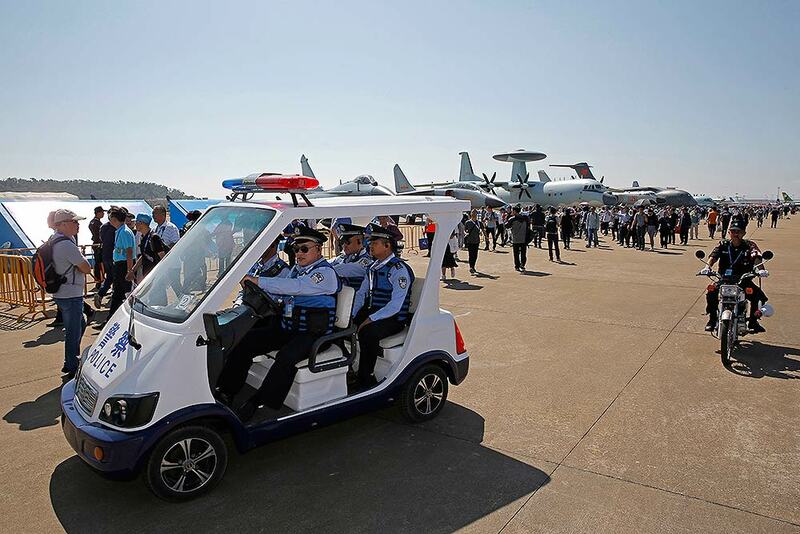 Police officers patrol at the 12th China International Aviation and Aerospace Exhibition, also known as Airshow China 2018, in Zhuhai city, south China's Guangdong province. 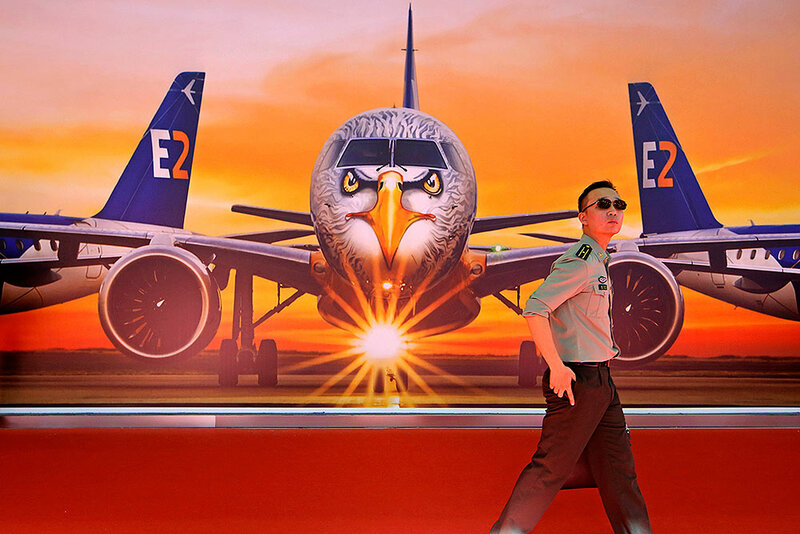 A visitor walks past a poster featuring the Embraer E190-E2 E190-E2 Commercial Jets during the 12th China International Aviation and Aerospace Exhibition, also known as Airshow China 2018, in Zhuhai city, south China's Guangdong province. 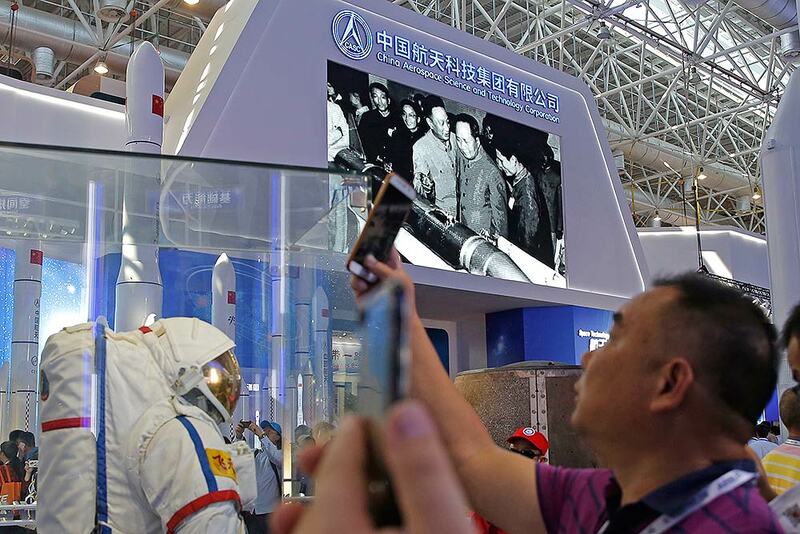 A man takes a photograph of the model of a Chinese astronaut during the 12th China International Aviation and Aerospace Exhibition, also known as Airshow China 2018, in Zhuhai city, south China's Guangdong province. 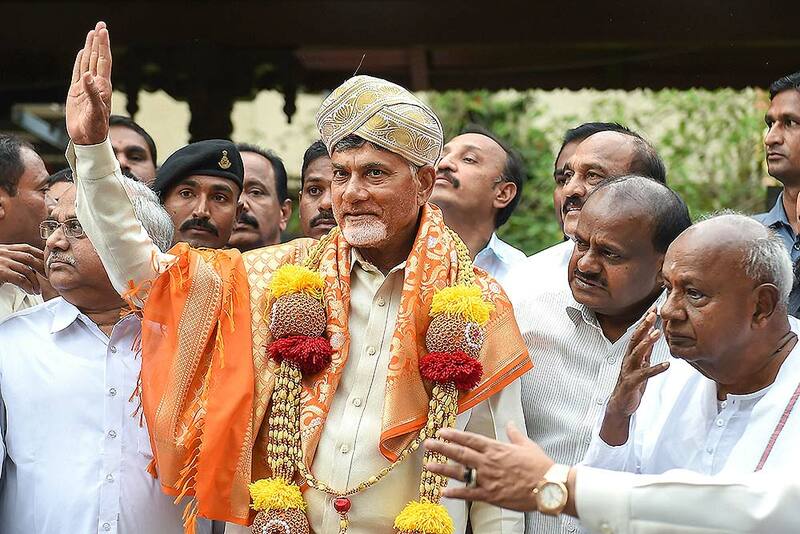 Andhra Pradesh Chief Minister N Chandrababu Naidu waves after being felicitated by Karnataka Chief Minister HD Kumaraswamy and former prime minister HD Deve Gowda ahead of a meeting, in Bengaluru. 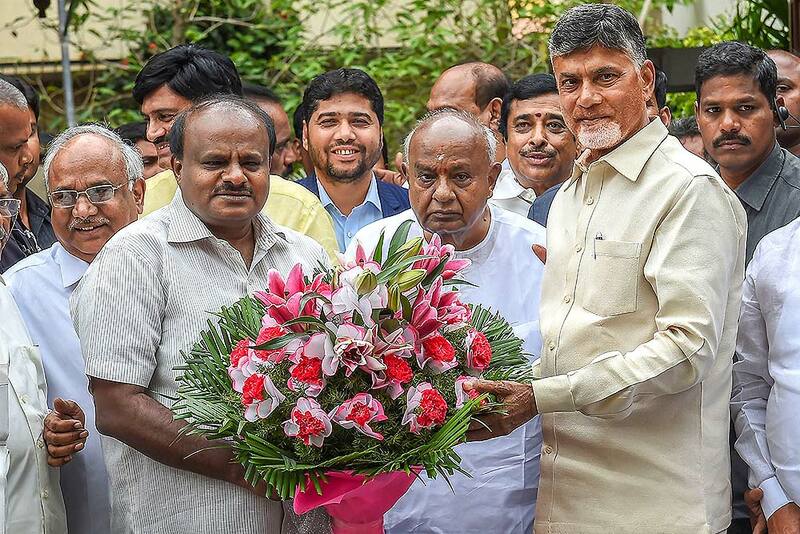 Andhra Pradesh Chief Minister N Chandrababu Naidu (R) greets Karnataka Chief Minister HD Kumaraswamy (L) and former prime minister HD Devegowda (C) before a meeting in Bengaluru. 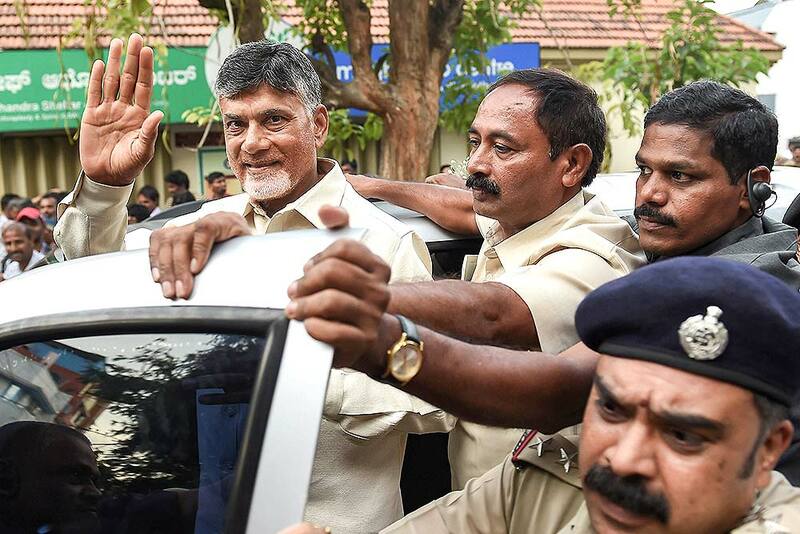 Andhra Pradesh Chief Minister N Chandrababu Naidu leaves after meeting JD(S) chief and former prime minister HD Devegowda (unseen) and Karnataka CM HD Kumaraswamy in Bengaluru. 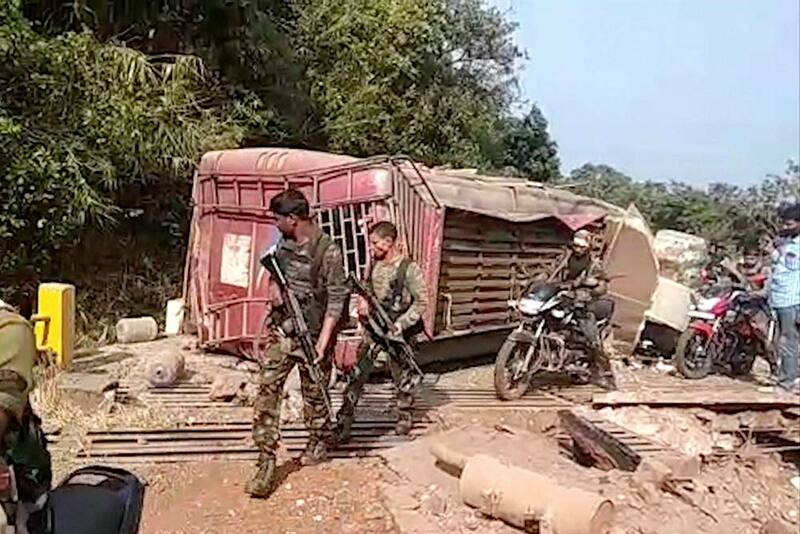 In this grab made from video provided by KK Productions, Indian paramilitary soldiers walk past the remains of a bus that was blown up by Maoist rebels in Dantewada district of Chhattisgarh state. Four civilians and a paramilitary soldier, were killed in the attack. 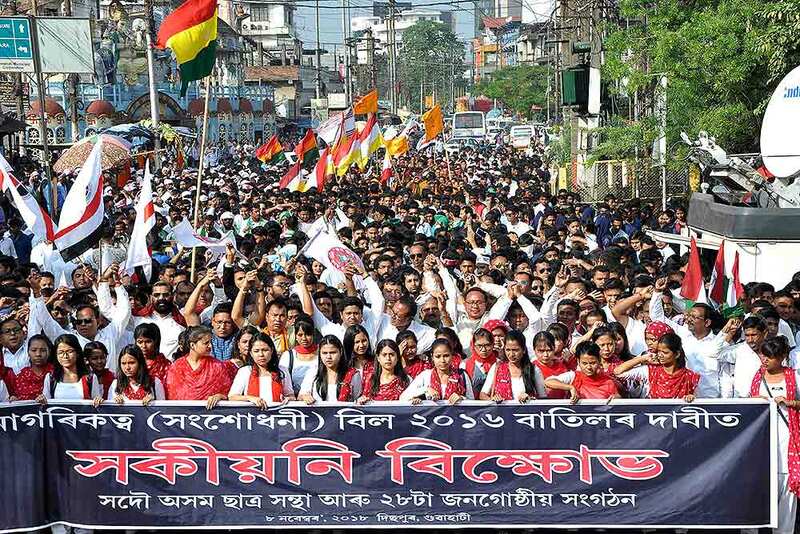 All Assam Students Union (AASU) activists along with 28 ethnic organizations take out a procession during a protest against the Citizenship (Amendment) Bill 2016, in Guwahati. 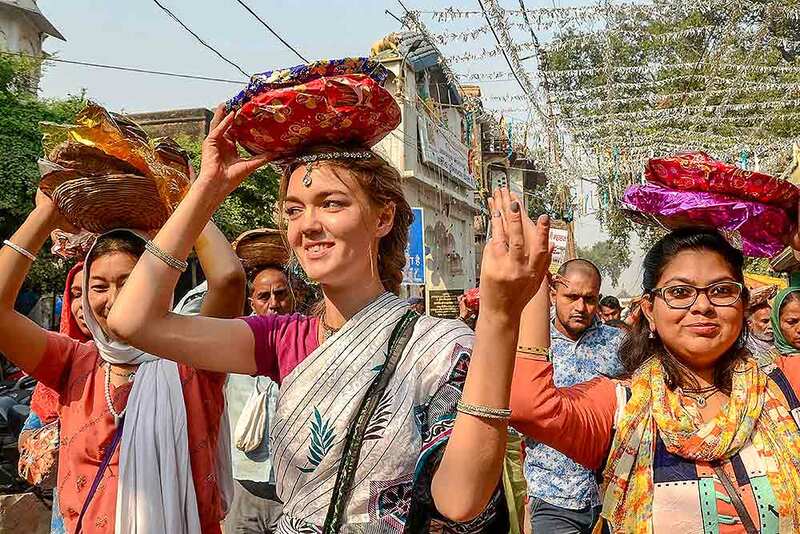 Devotees carry offerings on their head while trekking to the Govardhan Hill to celebrate the Hindu festival of 'Goverdhan Puja' at Goverdhan town near Mathura. 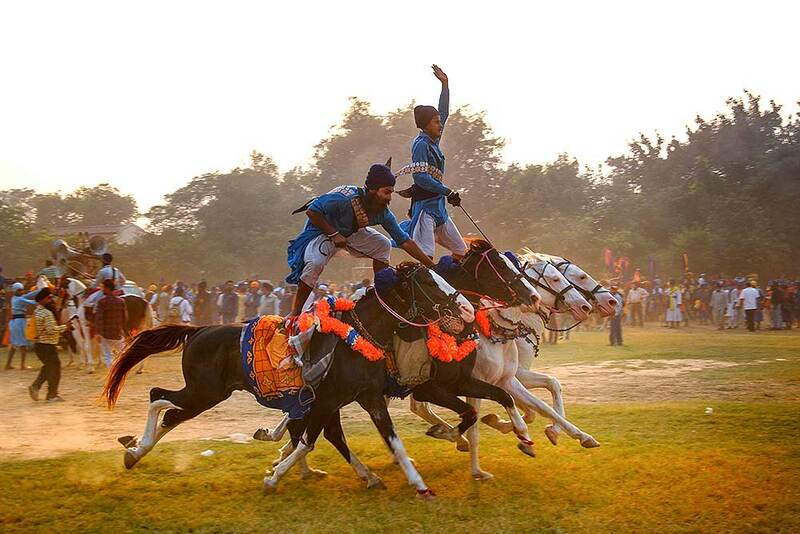 Nihangs or Sikh religious warriors display their horse-riding skills during celebration of the 'Fateh Divas' or 'Victory Day', in Amritsar. 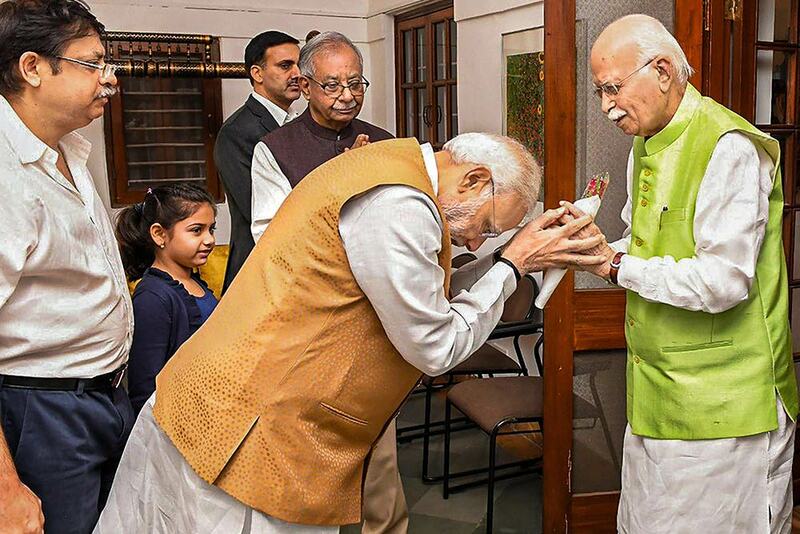 The day is celebrated a day after the Diwali festival to mark the arrival of sixth Sikh Guru Hargobind in Amritsar after his release from the Gwalior fort. 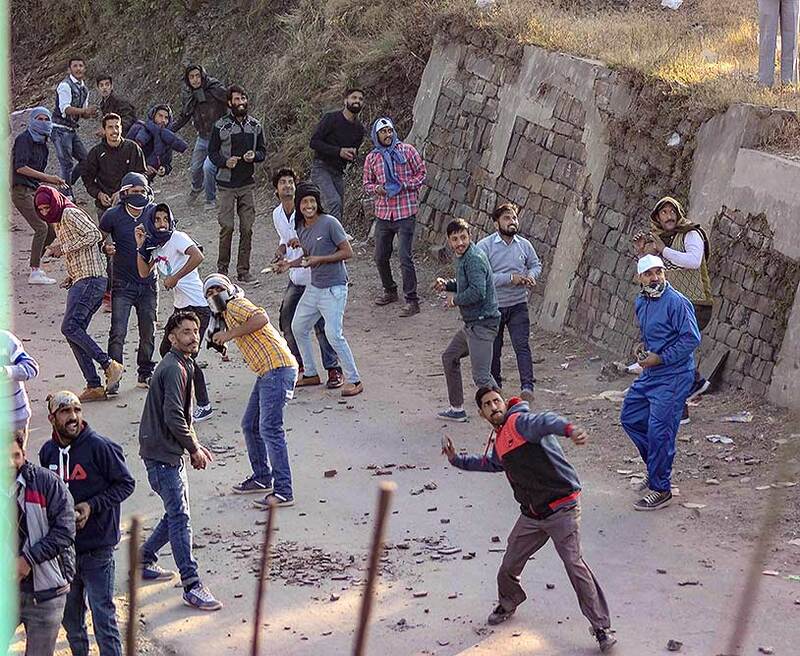 People take part in the traditional 'Pathar Mela', celebrated on the next day of Diwali, at Dhami near Shimla. 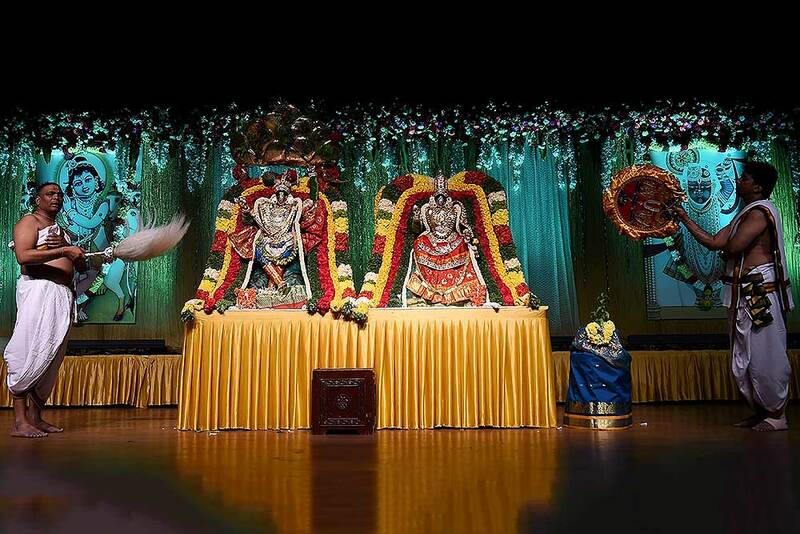 Priests offer prayers during the celebration of Annakut Mahotsav at Iskcon temple in Bengaluru. 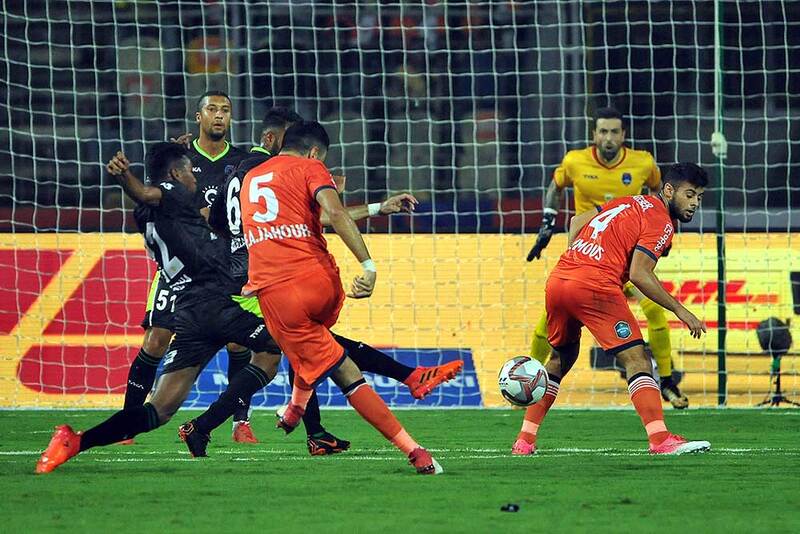 FC Goa and Delhi Dynamos players in action during the 31st match of the 5th edition of Indian Super League at the Jawaharlal Nehru Stadium, Fatorda, Goa.